I wanted to make something simple to hang above my mantle. Since last year I’ve been collecting blue items to decorate my beach inspired mantle. (makes me feel @ home!) This little wreath although understated fit the bill. Here is how I did it. 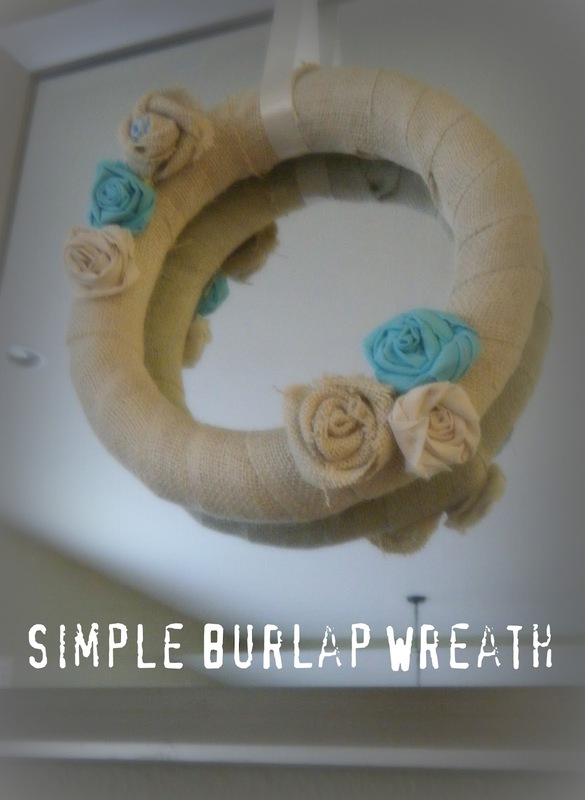 Cut the burlap into about 2 inch wide strips and wrap around the wreath form. Hot glue to secure the burlap once the wreath has been covered. I made small fabric rosettes by cutting 12 x 2 inch strips of the fabric of my choice. I then folded the fabric into a tube and started to roll up. Roll tighter at the begining then twist and loosen the fabric as you get to the outer edge of the rose. Hot glue the rose close. Then place the rose on the wreath whereever you like. You can add as many roses, buttons, bows, etc. as you would like. I wanted to keep mine simple. I added a cream ribbon so I could hang it from my mirror. There you go! A super simple and quick wreath that will add a pop of color to your room. I love tan and turquoise together. Turquoise, tan and brown are the new colors for my “woman cave” I am trying to finish renovating. Have a wonderful Monday! Your wreath is really cute! I really love the burlap roses. I’ve always wanted to make some, I just need to remember to pick up some burlap the next time I’m picking up all the rest of the crafty stuff! Thanks!! I know I’m a sucker for burlap too! Love it! Awesome–I am following your NEW LINKY FOLLOWER TOOL. Thanks for joining the LINKY FOLLOWERS PARTY HOP at Its So Very Cheri. A very pretty wreath! Love the pop of turquoise – matches your blog 🙂 Now following you via LF! haha:) i know im really in a turquoise mood lately!?! Maybe it’s because i’m having a boy!! LOVE all things burlap! I’m your newest Linky Follower. If you’re not following me yet hop on over and do! Pretty wreath – following you now on the Linky! Sweet wreath! I hoping for an early spring! Following you via LF and the LF blog hop. Hope to see you at Take Six. That is adorable – and your son is too cute!! Glad to have found you thru the Linky blog hop! New Linky Follower! Hope you can pop on over soon! I am your newest follower via the Linky Blog Hop and I would love to have you follow me back. Your spring wreath is so pretty – love the burlap. I love the wreath!! I’m following from the Linky blog hop…I’d love you to follow me back! Mrs Crafty this looks great. the simplicity is beautiful! I’m following from the LF blog hop…I’d love you to follow me back. Following you from the Linky followers blog hop. If you’d like to follow back I can be found at measuredbytheheart.com. Just stopping by from the Linky Follow Blog Hop. I hope you’ll visit http://www.Laughterandgrace.com and follow. Love it! I can imagine it in a million different colors. Visiting from the Blog hop! I followed you and hope you’ll follow me back! I found you on blog hop and I’m now a linky follower…I would appreciate if you can do the same. I’m a follower from the Linky Follower Blog hop! I hope you’ll follow me back! Following!! PLEASE come follow me back!! New follower here via the Linky hop! Hope you will stop by my blog, say hello and follow me back! Hi Tori, I also am a new follower via linky hop. I think you are a very creative young lady. Please stop by Hibiscus House if you get the chance would love for you to follow. I look forward to your posts..Nice to meet you. Hi Tori – I am your newest follower from TheStuffOfSuccess – I would love it if you could follow back through Linky Followers. Great blog! Have a terrific evening. This wreath is adorable! It looks beautiful over your fireplace! Thanks for sharing! I am your newest follower on both google and linky. Hope you’ll stop by for a visit…and hopefully you follow me too! I am a new follower:> Found your blog through the blog hop on Blissful and Domestic. Your blog is to cute! Would love for you to follow back! love meeting new blogging friends! Hi! I’m following you via Linky and hope you will follow me back! I would be delighted for your to link to Potpourri Friday! Link up starts on Thursday afternoon and usually have 250+ participants. Hope you will come check it out! Hi – I’ve seen some really neat burlap wreaths this year. Yours turned out really cute. I’m doing a little Linky Follower blog hopping and would love a follow back when you have time. LOVE this! I am creating my woman cave/craft area and my colors are turquoise, ivory, and brown. This would look PERFECT in there. I am your newest follower and would love if you’d follow me back! I can’t wait to see your next project! thats beautiful, thanks for showing how! Love your blog! My Sister in Law is called Tori – awesome name! Awesome tutorial!! I found you from Elegant Economies blog hop and am now following on Linky. I hope you’ll visit and follow back if you like. Have a Happy Valentine’s Day. Great job with the wreath! PS: I am your newest follower via Linky Followers. It’s very pretty, and so creative, simple and easy tutorial, I a, glad to visit here and following you via linky followers, I found you from linky followers party hop, happy Valentine’s day. Have a wonderful day! Thanks! Hi! I am your newest follower through Linky! Love your wreath! You are very talented! Come on over to my spot! Happy Valentines Day. Love that wreath also. I’m hopping over from the FOLLOW ME linky party/blog hop. I’m following you. Will you follow me back? Outstanding I love crafts/tutorials. The Linky Follow hop has turned out quite a crowd. I am now your newest Linky Follower. What a beautiful wreath for spring!